Binary Scam Alerts » Wealth Guru Scams » Tai Lopez SCAM Review, 67 Steps SCAM By Tai Lopez Exposed?! Welcome to our Tai Lopez official review and scam investigation. Tai Lopez, is one of the most recent self-proclaimed life coaches and gurus. Recently Tai has launched a service named the 67 Steps (the67steps.com), and we have received various complaints (some of which are justified while others are not) as well as constant requests to conduct an in-depth investigation. The fact-checking process has ascertained that the probability of this being an MLM, investment, Pyramid scam, or Ponzi Scheme is very low and it is most likely a genuine or legit business opportunity offer. Tai Lopez and the 67 Steps websites do not fall into the categories mentioned above, however the bottom line is that we have various unsatisfied customers which have purchased access to the accelerator program and paid $997 for 4 months. So, while fancy cars, mansions, a selfie with Rihanna, Mark Cubin, or any other celeb is really “cool”, it’s just not enough when you look at the end result. And the results are well know, Tai Lopez is making a ton of money when people buy into his Guru wealth program, but those very same people who ultimately pay for it (that’s you) are not really getting what the expected. Now, there are several reasons why this is happening, but at the end of the day there are two solid and undeniable facts which are the root of this whole scheme. The first has to do with the fact the he is a very experienced online marketer and affiliate who is at the top of his game. The second has to do with the customers or people buying into his scheme, and the financial situation in life they have reached which is making them more susceptible to these kinds of wealth gurus. Keep reading to see what we think about Tail Lopez and 67 Steps before you take a leap of faith and trust this slick marketer with your hard-earned money. Lopez is a California native and college dropout. He is also the owner of a well-known night club and previously worked for GE Capital after becoming a certified financial planner. Today he is a wealth guru and socialite who travels the world looking for investment opportunities. He is also a highly skilled advertiser and social media marketer. He’s also what’s considered by many to be a “people’s person” who can relate to all kinds of individuals from different segments of society, and that makes him a good net-worker as well. He claims he started from zero and made it big time to become a multi-millionaire, and while that may or may not be true he does seem to have money and a following. If You Snooze You Lose – What is the 67 Steps Program? Here we have the monetizing branch of the Tai Lopez empire. As is the case with every scheme, one has to consider two aspects. The first is how to attract visitors to your service. This is done via advertising, social media, video blogging (Tai particularly excels at this), content writing on blogs, public relations, and other forms of viral media such as popup ads or Facebook ads. The second has to do with the actual service or product your customers are buying. Lopez has both sides of the covered to perfection, and in this unique review you will gain insights as to how he does it and why he has been very successful at selling his services and products. 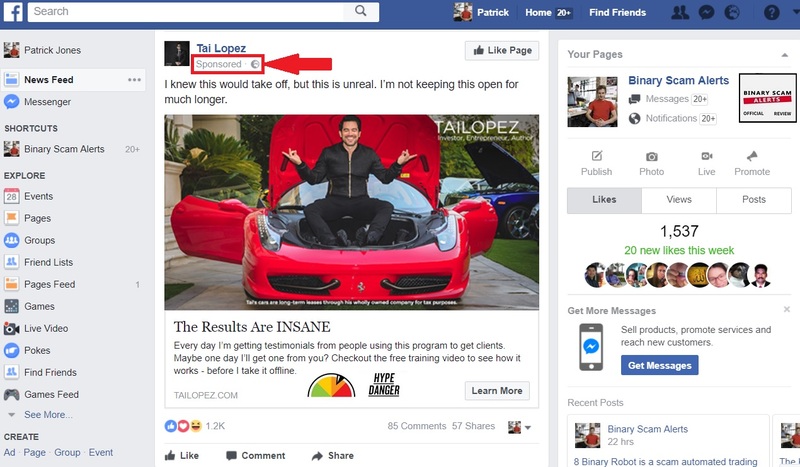 Is Tai Lopez a Scam Artist? There has been much talk and confusion about this, so let’s set the record straight. There is a huge difference between a bona fide con artist who is after your money, and what we refer to as a streetwise or shrewd marketer. At times the lines can get blurred, however this is not the typical pyramid or Ponzi scheme. What we have here is a very sophisticated affiliate program, coupled with a huge marketing budget. You have to tip your hat off to this guy because if you judge by the amounts of re-targeting ads, YouTube ads, and Google Ads, that have been poured into this scheme one would have to assume the return on investment must be significant. Hence, Tai’s products must sell like hotcakes and many people buy into his program. So How Come There Are Bad Reviews? As is the case with everything you do in life, if you try to take a short cut and don’t focus on changing your mindset as Lopez advises, you will end up as a loser in this high stakes game. Now, when you buy a shoe, cell phone, or any type of consumer good then you know exactly how much you are paying and what you are getting in return. This is not the case with these wealth programs. Its not enough to spend money on buying the instructional material and then loafing, you would actually have to act on what you are buying into and invest time and money if you want to make a real change in your life and become financially free. Most people are not willing to or don’t understand how to go about doing this, and this is very normal because not everyone can be an investor or at least self-employed. In fact, if we had more entrepreneurs then employees then we would not be able to have a functioning society. As the saying goes “can’t have too many chiefs and not enough Indians”, someone has to do the work. So, with that being said we have dissected what Lopez is offering in his 67 Steps program, and it has to do with how to motivate yourself, push yourself to your maximum potential, and maneuver out of a state of depravity, scarcity, or debt. There are some very useful life tips, but this should not be viewed as some magic formula that makes you instantly rich. Quite the opposite is true, the 67 steps program acts as a mirror which initially acts as a mirror which reflects your own image and identity and gets you to understand where you are in life, as opposed to where you want to should be. Tai Lopez is the quintessential net-worker and socialite who understands how to relate to a broad spectrum of people. He has documented his uncanny abilities via selfies and videos he actually video tapes himself using his own cellphone. Every thing he does is calculated to have a viral effect, and immediately goes live via social networks as mentioned in the title above. Tai uses Facebook ads to promote himself. Below is a good example of how he does it, and he’s definitely using sentences like “The Results Are Insane”, and pressure tactics such as “act now” which are very commonly associated with investment scams and may work, but they don’t add to his credibility. Still,we have to assume he already knows this and simply uses what works for him. He is very masterful at utilizing all the various forms of social media, and harnesses their collective viral power to squeeze “viral juice” out of each and every channel. So, you can see him on YouTube doing his sales pitch, then on Facebook, and if you continue surfing the web you will also see his add on various News Channels such as CNN or BBC, as well as other sites. What is the Accelerator Program, And Why is Tai Really Limiting the Number of Applicants? Before you are approved you have to pass the application phase. Initially it means you get a one-on-one call with a “top consultant” who helps you understand your goals better and see if the program is for you. Access to the “Vault”: 50 hours of training including videos and various content designed to get you on track. Private Interaction and Live Calls: Twice a month you can conduct a more intimate conversation and get live feedback. An Annual Pass To Tai Lopez Events: You can enter all of his events with this pass without having to pay the entry fees. Access to the Money Program: This includes money mastery, investment courses, owning and managing multiple properties, how to leverage your insurance, identifying effective business mentors, stocks and bonds, investment diversification, time and value concepts, and retirement planning. There are additional or “Higher Levels” you can qualify for and naturally these will cost you more. In professional jargon we refer to those as “up-sells”, and that is where every business makes the most profits. Think of it as a hotel selling a room for minimal rates, but charging you exorbitant fees at the bar or for meals. That is how they make their money, and Tai is no exception. The two higher levels are named the Entrepreneur and Persuasion Programs. The first discuss the actual operational aspects of how to go about raising capital and executing business plans and marketing campaigns. The second one focuses on copy-writing and advanced negotiating tactics. The real secret is his personality, traits, and character. This is not something anyone can teach you at school regardless of what university you go to. He is an autodidact and self-trained in marketing and business tactics. The fancy cars, the celebrities, the mansions, private jets, and the team of people who are constantly around him lend him a dimension of credibility and authenticity which gets you to drop your resistance and buy into his program. Are the houses and cars rentals, we will never know for sure, but even if they are someone is paying for it and these things don’t come cheap. At the end of the day this is what’s happening. Something about Tai Lopez and the 67 Steps appealed to you because you are at a stage in your life where you need something to latch on to. You need some hope, and someone to hold your hand and show you how to get your life back on track and improve your financial and personal situation. Lopez transmits an image of a young, charismatic, and successful businessman with a very compelling rags-to-riches story. Most people find it easy to relate to him because he started off with nothing (or so he says) and made it in life to become a successful multi-millionaire. So, once he has positioned himself in this image, its relatively easy to get others to jump on the gravy train and replicate his success. I mean, if he did why not you right? That’s exactly what he is trying to tell you, and in reality the chances of this happening are quite slim and that is why most people believe its a scam which leads us to the last part of our investigation. 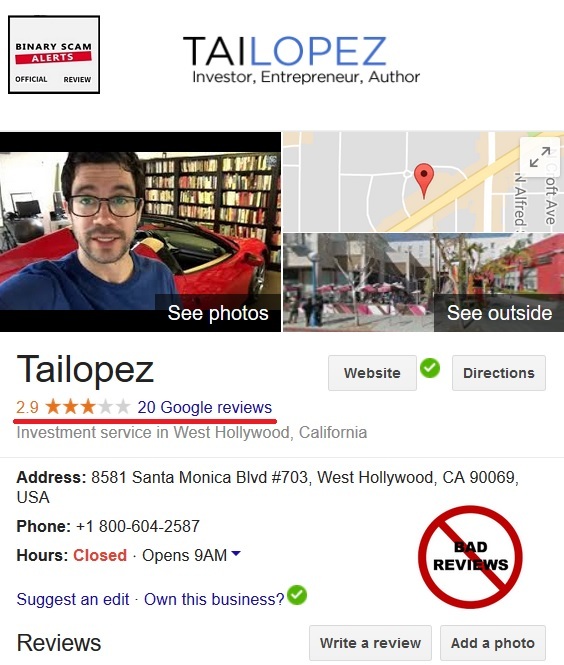 Tai Lopez and the 67 Steps program do not fall under the classic definition of SCAM, and for all intents and purposes it is for that reason we decided not to blacklist him or his services. One might mistake it for an MLM or Pyramid Scheme because there are affiliate marketers promoting the service and they have been known to be very aggressive. From a professional perspective, Lopez does an amazing job marketing his offers. He uses all the marketing tools at his disposal, these included a robust YouTube channel, Facebook posting and FB Ads, Google Ads, Re-targeting techniques to get people back to his site, personal charm and an uncanny ability to network with celebs connect to famous people such as Rihanna and even Larry King at CNN. At the end of the day, we all want to know what we are left with and the answer is fairly simple. In most cases you will be left holding the proverbial bag and that is because he can only offer guidance and life tips but in reality its YOUR personality, character, and will power to seize the opportunity and really act on it. Furthermore, I can promise you that you will HAVE to take risks and will most definitely make mistakes if you start down this path. However, if you are smart enough you will understand how to make small mistakes and based on that evolve to become a more successful and complete person. That is the essence of being an entrepreneur and operating in a fluid and unstable environment. Tai is trying to get you to reduce the learning curve and make less mistakes, but in essence our lives are based on the decisions that we make and you can’t blame Lopez for other people’s mistakes. The hot ones to watch out for are Bitcoin Code and Binary Robot 365. Our team of researchers have really looked for the best and most consistent money-making machines in the Forex or Options trading scene. Due to our efforts we were able to compile a short yet reputable list of signals as well as trading robots (AKA auto-traders). These are all listed in our recommended section. Closing Arguments – Recommended Or Not? Because we are looking out for the interests of our members and subscribers we can’t recommend Tai Lopez and the 67 Steps program, and it has nothing to do with it being a scam or not (again, we believe it does not fall under the most common definition of a scam). Our viewers are looking for a simple solution to kick start their lives and make them some extra cash either in a passive way or by spending some time (the less the better) to get there. So while it may be suitable for other opportunity-seekers, this is not what our viewers have signed up for and joining Tai Lopez and the 67 Steps program will simply cause them to become frustrated and angry for spending money and not being able to get an immediate return on their investment. We are always available through our Facebook Group and YouTube Channel and answer a lot of questions there so please join, subscribe, and get informed.